CampbellReith provided comprehensive site investigation and remediation design services to de-risk a former papermill site for a proposed secondary school in Purfleet. The site was known from previous investigations to have hydrocarbon and asbestos contaminated soils. This presented a major potential abnormal development cost and adverse programme implications. The investigations and assessments conducted by CampbellReith facilitated the on site reuse of materials limiting cost and programme implication. This also presented a highly sustainable option preventing large volumes of material being taken to landfill and avoiding the associated traffic movements through the local area. The detailed risk assessment and investigation demonstrated that remediation with regard to controlled waters risk was not required due to the low permeability Alluvium acting as a barrier to contamination transport both to the principal aquifer at depth and the River Thames. 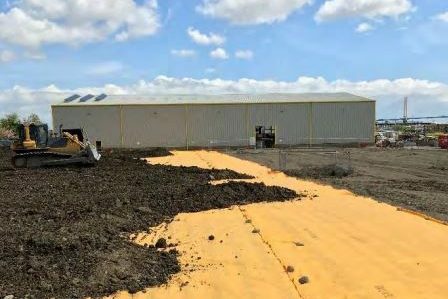 Remediation was therefore limited to installation of marker membrane and a validated capping layer for the protection of end users from contact with shallow soils in external areas. © 2019 CampbellReith. All rights reserved.